How Should You Choose an Electric Smoker? If you miss the delicious smoky taste of food prepared on charcoal, an electric smoker may be just the thing you need. To get the most out of your cooking, you should choose the best electric smoker. 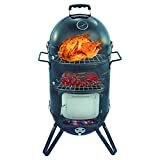 After going through thousands of electric smoker reviews, we have listed some points which will help you buy the right smoker. What Should You Consider Before Buying an Electric Smoker? 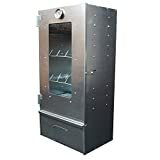 There are different types of electric smokers available in the market. But you need to consider a lot of factors before purchasing a good one. Window: Look for an electric smoker with a large front window, which allows you to watch food as it cooks. Programmable: Opt for programmable timers and temperature controls as they allow you to cook a variety of food. Temperature range: Look for an electric smoker that covers a wider range of temperature for a variety of cooking. 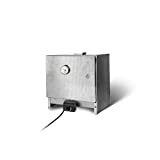 Power: Carefully check the wattage of your electric smoker as this will determine its power. 800 watts or more will be adequate. 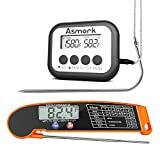 Digital thermometer: Look for a model with an accurate digital thermometer, which allows you to monitor how well-done the meat is. Racks: Carefully consider the size of the racks and number of racks included with the smoker. Three to four large, adjustable racks would be good enough to cater to most of your cooking needs. 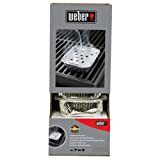 Removable drip pan: Look for a model with a removable drip pan and grease trap, which make cleaning your smoker easier. Additional features: Check for additional features, such as a remote control, a drip/water pan with rear or front access, an inbuilt air damper for better smoke circulation, and a wood chip dispenser to allow you to add more wood chips without opening the door. 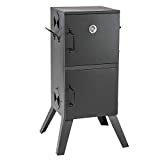 Prefer stainless steel: Look for a smoker made of quality stainless steel. 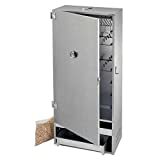 An 18-gauge stainless steel smoker provides adequate insulation. Cord length: Consider the length of the cord. 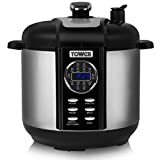 It should be long enough to give you some freedom with the power source, but it shouldn't be so long that it will get in your way while cooking.